Companies have spent a fortune on technology to get email, web, search and ad channels working smarter. But many business development teams have yet to see the benefit. Although they have perhaps the most critical contact with prospects, most continue to struggle with incomplete data and mis-aligned processes. Just think how much more they could achieve with the right insight and tools at their fingertips. There’s a turbo button somewhere. Let’s go press it. Ready for a more productive conversation? There’s no shortage of useful data. But when it sits on a multitude of systems, it can take forever to compile a complete picture. Demanding daily quotas give outbound business development reps precious little time to prepare contact information and plan their approach. Inbound calls or live chat sessions give them no time at all. Some BDRs need to access 20+ systems to build a complete picture of a prospect’s profile and behaviour. Even when reps have the data, do they really know what to do with it? They can see the prospect’s digital behavior, but a tendency to click is not the same as a propensity to purchase. Predictive scores may not indicate why a prospect is likely to engage. A social media “like” doesn’t mean “buy”. How can these data points provide the insight to spark conversations that convert? Proactive chat delivers 2x more Sales Ready Leads than equivalent time spent on targeting outbound calling. 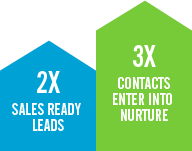 And nearly 3x as many contacts to enter into Nurture. Perhaps a Public Relations or Corporate Communications team owns the social listening platform, but what about social interaction? It’s now possible to put live chat on company Facebook pages. Who better to engage in direct conversation than a business development team trained to convert interest into opportunity? Leads get converted; leads get rejected. But what about the prospects populating the grey area in-between? Put them back into the email nurturing program until they reappear in the call queue and are treated as a new lead? We need systems and processes that enable scheduled call backs, we need an ongoing dialogue through social media, we need ownership. Is the business development team measured only by the number of conversions? Or is there a value attached to the nuanced information gathered, which will help to steer future conversations and segmented communication? How can this be gathered – and made actionable? And will agents take the time to do it, when their KPIs don’t provide the incentive? Give us a call and find out how we’ve helped business development teams - including our own - to raise their game by making better use of data and technology. Can you read Digital Body Language? Are your business development and sales reps equipped to interpret online behavior and use it to hone their approach?